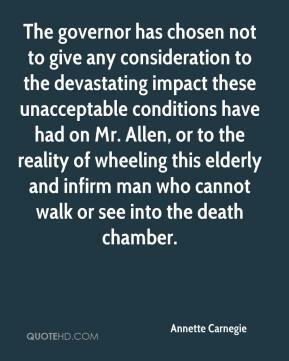 The governor has chosen not to give any consideration to the devastating impact these unacceptable conditions have had on Mr. Allen, or to the reality of wheeling this elderly and infirm man who cannot walk or see into the death chamber. 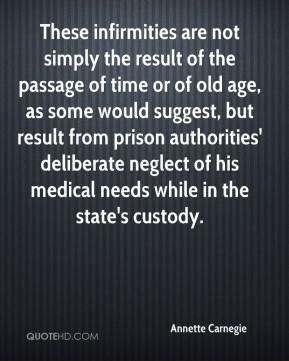 These infirmities are not simply the result of the passage of time or of old age, as some would suggest, but result from prison authorities' deliberate neglect of his medical needs while in the state's custody. 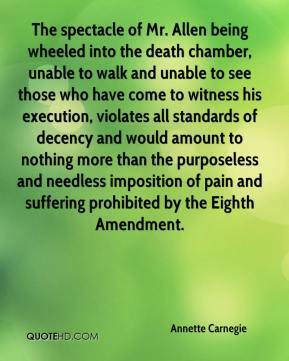 The spectacle of Mr. Allen being wheeled into the death chamber, unable to walk and unable to see those who have come to witness his execution, violates all standards of decency and would amount to nothing more than the purposeless and needless imposition of pain and suffering prohibited by the Eighth Amendment.